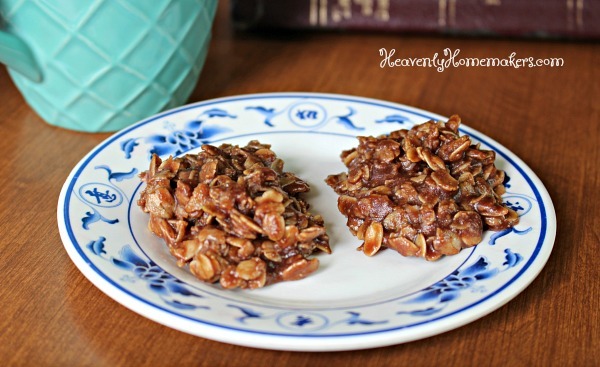 Honey Sweetened No-Bake Cookies – Prepare To Be Amazed! When you no longer eat much sugar, but you want to enjoy your childhood favorite No-Bake Cookies…you make the cookies with a little bit of honey to see if you can pull it off. They turn out so delicious you start dancing in the living room. What? Of course you can dance about cookies. Delicious No-Bake Cookies made with honey are worth dancing over. My friend Kim sent me this recipe idea, then I tweaked it just a bit to make it my own. I guess we could say that it’s Kim’s fault that I was dancing in the living room. She can be glad I didn’t invite her over to watch. Though I probably should thank her with a cookie sometime. In a medium-sized sauce pan, stir together honey, peanut butter, butter, and cocoa powder. Melt and stir ingredients over medium heat until well combined and slightly bubbly. Add oats and stir until coated. Scoop 1-2 Tablespoons of mixture onto a parchment paper-lined cookie sheet. Chill No-Bake Cookies in the refrigerator until they are set, about 1 hour. Want some more Low Sugar Cookie recipes? With all these recipes making us so very happy, we will all be dancing in our living rooms. What will the neighbors think? 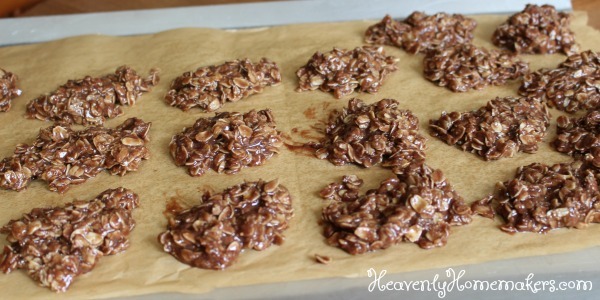 I’m looking forward to trying this version of no bake cookies! Yum!! Hi! Long time follower here! We made these tonight with just a few alterations for our son’s long lit of needs! So thankful for your blog, it has been a go to for a very long time. I subbed cashew butter for peanut butter *sob* and made half with rice chex and enjoy life chocolate chips and the other half with oatmeal and regular chocolate chips. Yummo! Hi, I have been looking forward to making these lemon melt-aways for a long time and finally did today. Mine did not look like yours at all. Mine were much darker. I was concerned about using whole wheat pastry flour. Is that what you used for the cookies in your picture? I did use blonde coconut sugar, which said it has a ratio of 1:1 with regular sugar. I also added a zest of one lemon. The cookies were boring and yuck. My husband and daughter didn’t finish one, and I threw the rest of the dough away after 2 cookie sheets. They didn’t taste lemony at all. I wish I could send you a pic of mine.